The number of internet users in the Arab World is expected to rise to about 226 million by 2018, according to the Arab Knowledge Economy report 2015 - 2016. The Internet penetration rate will jump from about 37.5 per cent in 2014 to over 55 per cent in 2018, or about 7 per cent above the estimated world average of 3.6 billion users. These are the latest statistics noted in the Arab Knowledge Economy Report 2015- 2016 which will be launched by Orient Planet Research today (Tuesday, March 29, 2016) at the Waldorf Astoria Dubai Palm Jumeirah Hotel. 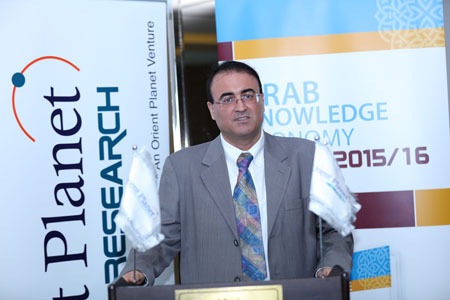 Developed by Orient Planet Research, an Orient Planet Group venture, in cooperation with the Research Consultant Mr. Abdul Kader Al Kamli, the Arab Knowledge Economy Report is a research study that provides insights and statistics on the region's information-driven economic framework in the context of its dynamic and ever-expanding economy. Arab Knowledge Economy Report 2015-2016 will throw the light on major trends impacting the market within the region as well as other key indicators. The information featured in the report will serve as an invaluable tool for governments, economists and businessmen across the region as it provides a strong overview of various factors affecting the knowledge economy sector. Abdul Kader Al Kamli, Research Consultant, Orient Planet Research, said: "The Arab World is in the midst of change following a number of social and political upheavals. In the face of these dynamic reforms, many countries within the region continue to make great strides in their efforts to shift to a knowledge-based economy, marking a noticeable improvement in knowledge society indicators. In fact, The Global Competitiveness Index (GCI 2015-2016) ranked Qatar 14th and the United Arab Emirates (UAE) 17th among 130 nations in the overall outcome. The UAE ranked first globally in six out of the 114 indicators. This has encouraged the development of smart government initiatives." "We are optimistic that the data being presented within this edition of the Arab Knowledge Economy Report will serve as a point of reference for public and private organizations in the region as they develop their strategy for the coming years." Kamli added. Nidal Abou Zaki, Managing Director, Orient Planet Group, said: "The Arab world is in the middle of an economic evolution as a result of the changing oil prices. This has prompted a shift towards establishing a diversified economy with a particular focus on cultivating a knowledge economy evident in the increased investment towards ICT infrastructure as part of the region's effort to move away from its dependency on oil. Considerable improvement has been made across health, service delivery, among other sectors. The UAE is an emerging leader in e-government development globally and its level of digitalization is comparable with that of global leaders. Dubai outranks digitally advanced world capitals, such as London, Oslo, Stockholm and Vienna in terms of Digital Governance. Muscat came second among Arab cities in this regard, followed by Riyadh, Cairo, Amman, Tunis, Casablanca, Baghdad, Kuwait and Manama." The report provides comprehensive data on various trends within the knowledge economy. It also reflects increased investments towards technology and Information and Communications Technology (ICT) infrastructure as well as noticeable advancements in research and development as evident in the high numbers of patents registered in Saudi Arabia. The dynamic expansion of the knowledge economy is largely a result of the efforts of the countries within the region to shift their dependency from an oil-driven economy. This has led to pioneering initiatives for developing technical advancements in key economic sectors. Its influence has extended towards retail, hospitality and various other business areas. UAE ranked first on the 2015 Arab E-performance Index, with an average of 67.35. 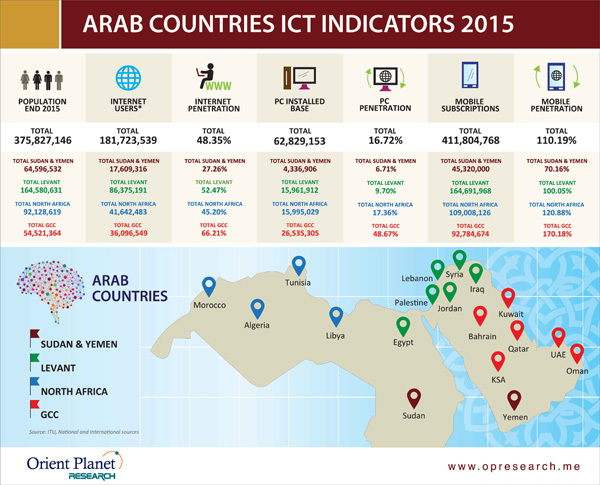 According to the report, the six GCC states led the Arab region in terms of ICT indicators in 2015. Bahrain took a commanding lead, registering 74.15 per cent in Internet user penetration, while Kuwait registered the highest in mobile subscription penetration with 194.62 per cent. The Arab ICT Use Index examines four major indicators for each of the 18 MENA economies: mobile phone subscribers, fixed-line subscribers, Internet users, and installed computers. The index is calculated by adding the values of these four indicators for each country and dividing the sum by its population. A higher score on the index indicates more aggressive ICT adoption. The Arab Internet Population Forecast (2014-2018) also reflects the rapidly expanding sector, with the number of internet users in the Arab World predicted to rise to about 226 million users by 2018. According to the report, the Internet penetration rate will jump from around 37.5 per cent in 2014 to over 55 per cent in 2018, which would be approximately 7 per cent above the world average of 3.6 billion forecasted by eMarketer. The presence of Arabic content was also studied, particularly through Wikipedia, a free online encyclopedia which allows any individual to add or edit its content. Wikipedia was launched on January 15, 2001 in its original English version, followed by a French version and subsequently in hundreds of other languages. As of October 2015, Wikipedia boasted customized versions in 291 languages, including Arabic, and in total hosted more than 34 million articles. An overview of leading online retail stores is provided within the report in recognition of growing interest towards Middle East internet companies. Online shopping in the Middle East has witnessed high growth in the past few years, and has subsequently encouraged global investments into the region's e-commerce market. The region's shift to a knowledge economy is well documented within the report with a crucial emphasis on Arab Digital Cities. According to the report, Dubai ranks among the world's top 10 cities in Digital Governance, topping world capitals such as London, Oslo, Stockholm and Vienna in 2014. A survey of the official city websites of 100 major cities in 100 countries has ranked Dubai ninth overall, fourth in service delivery and fifth in privacy and security. The survey was released in September 2014 by Rutgers, the State University of New Jersey - Newark. The survey titled 'Digital Governance in Municipalities Worldwide' is an assessment of the online presence of municipal or other official city websites or portals where the government provides information about city administration and online services. Ten Arab cities were also successfully assessed.  Amman (Jordan), Manama (Bahrain), Riyadh (Saudi Arabia), Cairo (Egypt), Kuwait (Kuwait), Muscat (Oman), Casablanca (Morocco), Baghdad (Iraq) and Tunis (Tunisia) were also included aside from Dubai. The wide range of milestone achievements in the educational system can also be gleaned from the report as noted in the 2015 Academic Ranking of Arab Universities. King Abdulaziz University also ranked six worldwide in Mathematics. In 2015, five Arab universities appeared on the Shanghai Academic Ranking of World Universities (ARWU). Four Saudi universities achieved a significant milestone by placing on the ranking in its latest issue released in June 2015, placing first on an Arab and Islamic scale. Both King Saud University and King Abdulaziz University remained among the top 151-200 global universities in 2015, while King Abdullah University of Science and Technology moved from being part of the top 401-500 global universities in 2014 to the top 301-400 in 2015. King Fahd University of Petroleum remained in the top 401-500 global universities. Seven Saudi Arabia supercomputers were also included in the TOP500 list of the world's most powerful supercomputers. The patents also reflect the need for greater emphasis on research and development and fostering a culture of innovation. Since its inception till the end of 2014, a total of only 2,339 patents were granted by the United States Patent and Trademark Office (USPTO) to residents of Arab countries. To put this number into context, the total number of patents granted by the USPTO in 2014 alone reached 300,678. Saudi Arabia was the clear winner of the Arab patent race, registering 294 granted patents in 2014 and 1,152 in all documented years. Kuwait came in a distant second with 98 patents in 2014 and 370 in all years, while Egypt ranked third with 45 patents in 2014 and 257 in all years. Arab Knowledge Economy Report 2015-2016 provides a comprehensive overview of all the Arab countries' rankings, developments and initiatives as well as the current state of the region's ICT structure.